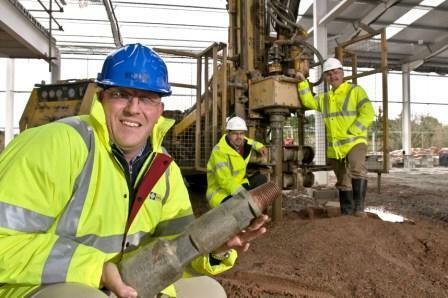 Contractors building a £2.9 million factory development in Redruth have drilled a borehole almost 600 feet (180 metres) into the ground to cater for a high-tech Cornish engineering company moving to the site. The borehole, which is around six inches in diameter, will be used by Calidus Engineering for systems testing. The company specialises in ‘downhole’ and subsea technology for the oil, gas and geothermal industries and requires hostile conditions deep underground to put its equipment through its paces. Calidus is relocating from five separate sites in Falmouth and Redruth to new units being developed by Priority Sites on the Treleigh Industrial Estate in Redruth. Calidus has 26 staff and intends to double this in three years. The £1.4 million move has been part-funded with £450k from the ERDF (European Regional Development Fund) Convergence programme and will more than double the company’s floor space. Priority Sites is building four new units in two separate buildings at Treleigh totalling 2,806 sq metres. Calidus has bought two attached units totalling 1,580 sq metres. The remaining space is under offer to another company.